Looking for a flavorful grilled appetizer for your 4th of July celebration? 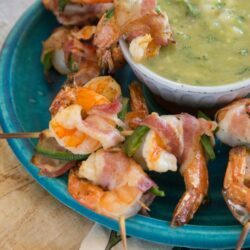 These bacon-wrapped shrimp with slivers of jalapeño are one of my family’s favorite starters. I just love to throw them on the grill for that irresistible smokiness, especially for a summer party. 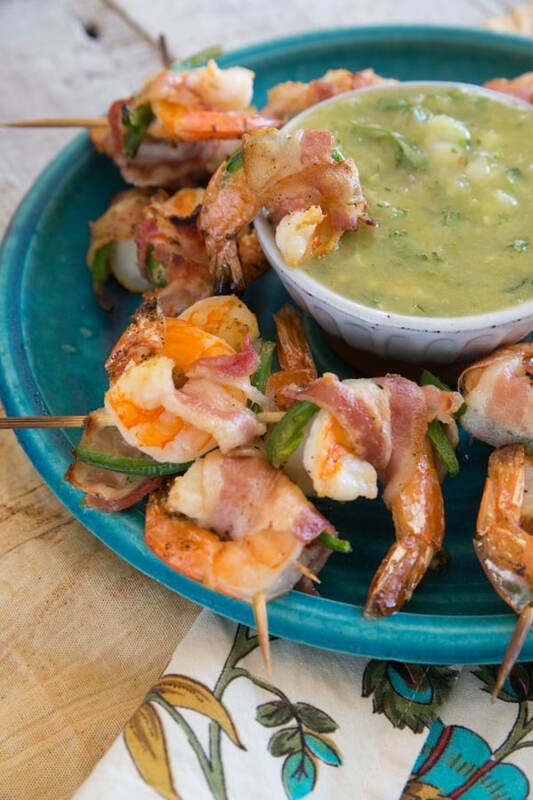 Serve them with the zesty Las Palmas Green Enchilada Sauce for tangy salsa verde dip. 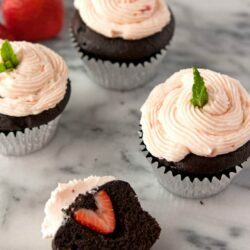 They are absolutely mouthwatering and delightful. Enjoy! Wishing you a great 4th of July filled with pride, honor, fun, and lots of delicious food. In a blender place garlic, chopped serrano and jalapeño peppers, onion, cilantro, sauce, and blend for about 1 minute. Do not over blend. Salsa should be chunky. Taste and add salt as needed. Microwave bacon on high for 1 minute. 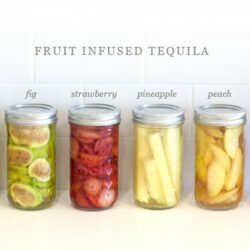 Separate slices and cut slices in half crosswise and let cool. In a bowl, combine melted butter, lime juice, garlic powder, pepper, and oregano. Place bacon-wrapped shrimp evenly on a foil-lined cookie sheet. Place under broiler. Broil for 10 to 12 minutes, turning over after 5 to 6 minutes. Skewer 3 to 4 shrimp per skewer. (If using wooden skewers, don’t forget to soak skewers about 30 minutes before using.) Place crosswise on the grates and grill for about 4 to 6 minutes on each side. Remove from skewer and serve warm with salsa verde. 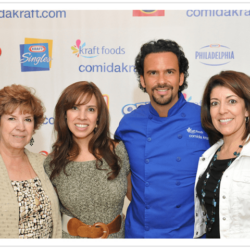 A special thanks to Las Palmas Sauces for sponsoring this video and blog post. Opinions are my own.